Do you know how much your ATM withdrawals abroad are costing you? They tend to be pretty small charges so you probably don’t notice them much, but ATM fees can seriously add up, especially if you’re a long-term traveler. For each foreign withdrawal, your home bank may charge about $5 per transaction. If you limit your withdrawal to once a week, you would spend $20-$25 a month on ATM fees. That’s at least $260 a year. On top of the fees from your own bank, the ATM machine abroad may also charge you about $5. Assuming fees of $10 per transaction, you could easily end up paying $520 a year with weekly withdrawals. That’s not even taking into account the currency conversion fee, which usually ranges between 1% and 3% of the transaction. And because many ATMs have withdrawal limits, you could very well need to get cash more frequently than just once a week. After all, in some countries people use cash almost exclusively. Think about all the things you could buy with $520 (or probably more). Do you really want to donate all that money to the bank? No? 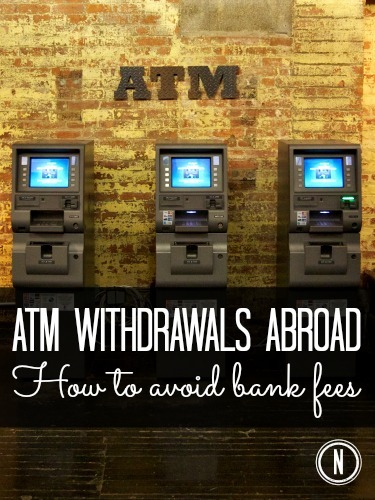 You have a few options to avoid bank fees when you withdraw cash from ATMs abroad. There are three types of fees you need to watch out for. Some banks don’t charge any foreign withdrawal fees themselves, but you may still have to pay the withdrawal fees charged by the foreign ATMs and currency conversion fees. I’m seriously jealous of American travelers who could get Charles Schwab checking accounts. It’s the best bank account you could get if you frequently withdraw money abroad. Charles Schwab doesn’t charge any fees for foreign withdrawals or currency conversions. It even refunds all ATM fees charged by other banks all over the world — none of the other bank accounts I know does this. And you don’t even have to pay a monthly fee to maintain the account! Charles Schwab prefers not to do business with people who spend too much time outside the U.S., but a little birdie told me that you should be fine as long as you don’t advertise your nomadic status. There are no foreign withdrawal fees with TD Canada Trust All-Inclusive Banking Plan (previously Select Service Bank Account), but you have to maintain a balance of at least $5,000 to get this account (or pay a monthly fee of $29.95, which I personally think is ridiculous). Yes, I know it’s not a very good deal. Unfortunately, none of the other Canadian banks offer anything better, as far as I know. Metro Bank Current Account doesn’t charge foreign withdrawal fees or currency conversion fees for customers traveling within Europe, but there may be fees charged by the foreign ATM. There’s no monthly fee for this account. Traveling outside Europe? Look into the Norwich and Peterborough Building Society Gold Classic Account. There are no foreign withdrawal fees charged by N&P itself, but there may still be fees charged by the foreign ATM. To keep this account, you have to maintain a balance of £5,000, deposit £500 a month into the account or pay a £5 monthly fee. For Australians, the Citibank Plus account would probably be the best choice for a debit card to use abroad. 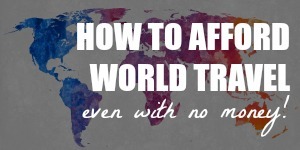 There are no foreign withdrawal fees as long as you stick to Citibank ATMs and there are no currency conversion fees. The Air New Zealand OneSmart MasterCard is not a bank card, but you can use it to withdraw cash when you’re abroad. To use it, deposit some money into your account and pre-load the card with the currencies you need. 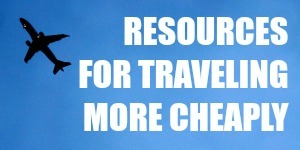 There are no foreign withdrawal fees or currency conversion fees, but there may be fees charged by the foreign ATMs. Additionally, you have to pay each time you load funds into the card. Click here for more details on this card. Some banks have foreign partners whose ATM network you can use for free. For example, RBC bank — which is Canadian — also operates in the U.S., but it doesn’t have ATM machines of its own outside Canada. RBC customers can instead use PNC Bank’s ATMs for free withdrawals when traveling south of the border. That’s a pretty specific example and it may not be useful unless you’re a Canadian who visits the U.S. a lot. This is where the Global ATM Alliance comes to the rescue. If you open an account with one of the Global ATM Alliance banks, you can take advantage of free withdrawals from all member banks’ ATMs. You may still be charged currency exchange fees, but you’ll be spared withdrawal fees from both your home bank and the foreign ATM. If none of the above options suit your needs, your best bet would be to approach a multi-national bank. Some banks have enough international presence to place their own ATMs in many countries. If you open an account with such a bank, you may be able to avoid ATM fees when you withdraw money from the bank’s ATMs overseas. However, the specifics depend on which bank you choose and also in which country you open your account. Citibank’s ATM network covers more than 40 countries and HSBC has ATMs in more than 70 countries and territories. If either one of these banks operates in your country, speak to your local bank representative about foreign ATM withdrawals. ATM Image: Modified from a photo taken by Marcin Wichary (CC BY 2.0 Licence). So if you have a debit card from Scotia Bank you can withdraw for free from Barclays? I signed up for a Tangerine account which SB owns to get free withdrawls but some people say there is only one free country? I asked customer rep they were unhelpful. Yes, if you have a Scotia Bank debit card, you can withdraw money from a Barclays ATM without being charged any fees. It also definitely works for multiple countries; not just one. I’m not sure if Tangerine is also included in the program. The Scotiabank website has a dedicated section to explain how it works, so you may get more helpful answers from Scotiabank reps. Here’s Scotiabank’s info on the Global ATM Alliance. Always an important travel finance topic, however you missed one of the most popular banks in the U.S. that does not charge foreign currency conversion fees. Whether you sign up for Capital One Bank or Capital One 360 (the online only version that used to be called INGDirect in the US), you can use your ATM and also their credit card with 0% currency conversion fees. I have been a customer for over 8 years so as you can imagine I always recommend it to Americans who travel abroad often. Since this topic comes up so often, I also wrote an article on the subject for Americans taking a European vacation. Too often I hear from people that they went to their local bank to buy Euros or British Pounds (Sterling) for their trip to Europe – hardly the best deal. That’s not a bad idea for emergency money if this is your first trip to Europe and want to reduce your risk. I hope you add Capital One to your list of recommendations as well. Hi Scott, thanks for the tip! I agree with you, it’s better to only get a small amount of cash from home just in case, then get more from ATMs at the destination. Capital One did come up in my research, actually. I left it out because Charles Schwab seemed to be a better option for ATM cards. Their credit cards seem great though, as I noted in a previous blog post. Correct me if I’m wrong, but Capital One has different fee structures depending on the state, the version of the bank (online or brick-and-mortar) and type of account. It just seemed a lot less straightforward than Charles Schwab. I know they don’t charge currency conversion fees or ATM fees themselves…can you confirm that they reimburse the fees that foreign ATMs charge? If yes, is this only for Capital One 360 or for both versions? To think I already have HSBC :O I’ll see if I can withdraw from a Japanese HSBC before using again another 7/11 ATM!! Thank you for the tips!! Good luck, Meiji! If you contact your bank, someone should be able to give you some tips/answers. 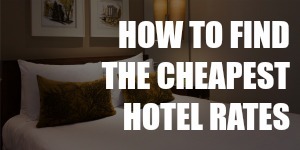 Bitcoin can be useful when traveling, especially for extended stays. Offers to trade in-person for cash can be found on LocalBitcoins . com, for instance. Also, in some countries there are cash-out methods to the local mobile money service (e.g., M-Pesa in Kenya) and elsewhere (such as in the Philippines) bitcoins can be sold and cash picked up at a money exchange agent location. I am planning on spending six weeks in Japan for a student exchange program in the fall and wanted to make sure that I would be able to withdraw my money from an ATM. I had never considered using Bitcoin while traveling. Do you know if Bitcoin ATMs are available in Japan? Hi Sara, great timing! I recently wrote a guide to handling money in Japan. Here it is — Japan Travel Money Guide: 4 Essential Tips for Survival. You should be able to withdraw money from some Japanese ATMs, as long as you know which ones will take foreign cards. I think these regular ATMs are still the most convenient option for cash withdrawals. With regards to bitcoin…I’m not very familiar with the subject, but yes there are bitcoin ATMs in Japan. There aren’t that many of them though, and they’re mostly located inside restaurants.